As a two-way forward for the Toronto Maple Leafs, Zach Hyman’s on-ice skillset is diverse. But the Toronto native is spreading his talents off the ice too, with the launch of his own esports organization in October. With Eleven Gaming, or E11, Hyman is the latest professional athlete to jump into the burgeoning industry – following other big sports stars including Michael Jordan, Alex Rodriguez and Steph Curry who have all invested in various esports teams. The growing interest from star athletes in esports – in which fans watch professional video-game players in arenas and on TV – not only highlights the industry’s increasing popularity and financial clout, but also athletes’ own love for video games, Hyman says. E11’s roster now consists of seven athletes, as well as two influencers and content creators, Hyman said. While the company would not disclose how much Hyman has invested in E11, its revenue will be driven by tournament prize money and sponsorships that athletes earn. The team competed in its first major tournament last month at TwitchCon in San Jose, where up to $1.8 million in prizes was up for grabs for Fornite. Hyman’s ambition to help turn E11 players into esports stars comes as the global audience for competitive gaming has grown 17.8 per cent year-over-year to 222 million, according to esports research firm NewZoo. Another firm, Esports Charts, says more than 200 million unique viewers watched the League of Legends World Championships this year – nearly double the 103.4 million viewers who watched the Super Bowl in February, according to Nielsen. “Kids these days don’t really watch that much TV, they go on their laptop, and they’re watching stuff on YouTube, they’re watching Netflix and video games. That’s something hard for people to get their heads around – is that people actually enjoy watching other people play video games,” Hyman said. E11’s athletes will compete in Fortnite, a wildly popular Hunger Games-style shooter game that has attracted more than 125 million players worldwide, and a fan base that includes many pro athletes. Hyman said he chose Fortnite due to the size of its audience, its low costs of entry compared with other competitive games, and some of the big cash prizes that the game has drawn. “The combination of those things were the driving force behind us choosing Fortnite,” said Hyman, acknowledging other popular games like League of Legends and Overwatch, which use a franchise model, where teams buy into a league. Esports is a decade-old industry if you ask any competitive gamer, but this flurry of interest from traditional athletes has helped bring the sport into the mainstream – and according to Steven Salz, co-founder and co-CEO of Toronto-based PMML Esports Investments, investors are scrambling to catch up. Salz adds that for now, there aren’t too many ways for average investors to put their money in esports directly. Esports revenue will hit $905.6 million in 2018, a whopping 38 percent jump from last year, according to estimates by Newzoo. Roughly half of that money goes to publisher-owned assets, said Salz, leaving E11 and the thousands of other organizations, independent content creators and influencers to fight over the remaining half of the revenue pie. While Hyman admits he’s busy enough between playing for the Leafs and running his own business, he says his COO Oliver Silverstein will be able to handle E11’s day-to-day needs. Still, Hyman, who is also a children’s book author, says having a hand in video games isn’t work. 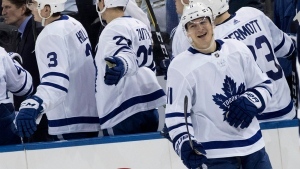 Still, Hyman says that while he’s entered the esports business, that doesn’t mean he’s the best Fortnite player in the Leafs dressing room. That honour goes to forward Mitch Marner, Hyman said.